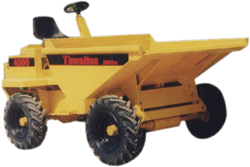 Our THWAITES dumpers are rebuilt in our workshops and we take pride in the quality of workmanship and attention to detail. They have been exported to many parts of the world. All machines are fully rebuilt to a high professional standard and have a full parts warranty for 12 months from delivery to the end user. All machines are supplied with a serial number and full comprehensive parts books. Our dumpers are shot blasted, resprayed in manufacturer's original colours (or colour of your choice), all details, instruction plates, transfers replaced, and are fitted with brand new quality tyres. Sensible parts packages can be supplied for each machine and we welcome inspection by SGS, Cotecna etc. We will be pleased to quote for special build dumpers and can supply them fitted with exhaust purifiers, spark arrestors and a variety of tyres for different applications. VINTAGE AND COLLECTORS! We have an extensive parts inventory inc. engine spares and parts books records for many of the older THWAITES models (and some other British makes of dumper.) Please ask.